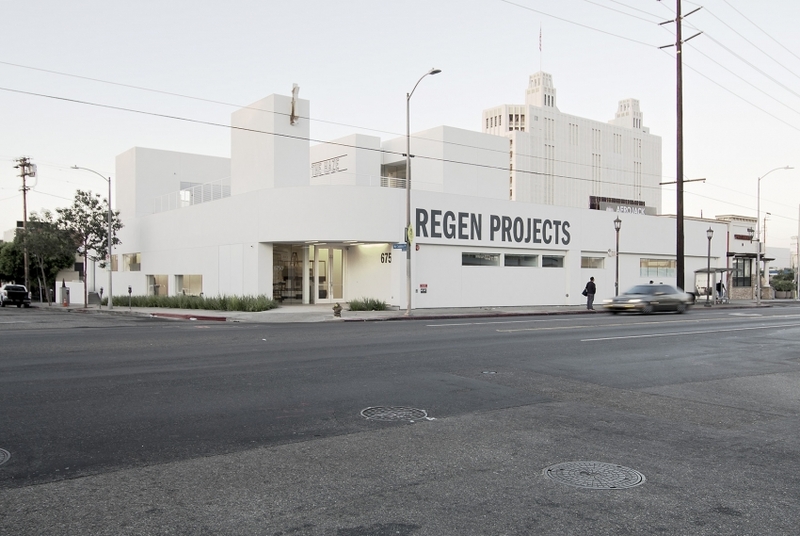 Founded in 1989, Regen Projects is a contemporary art gallery in Los Angeles, CA. Stuart Regen and Shaun Caley opened Stuart Regen Gallery at 619 North Almont Drive with an inaugural exhibition by Lawrence Weiner. From its inception, the gallery has been committed to presenting singular and groundbreaking exhibitions like Matthew Barney’s 1991 debut and Catherine Opie’s seminal portraits, as well as off site projects like Richard Prince’s First House. In 1993, the gallery relocated to 629 North Almont Drive and changed its name to Regen Projects to reflect the expansive vision of its programming. In 2003, Shaun Caley Regen extended the gallery to 633 North Almont Drive. This space allowed for more ambitious projects such as Glenn Ligon’s Text Paintings: 1990-2004 and Doug Aitken’s The Moment. In 2007 Regen Projects opened a second space at 9016 Santa Monica Boulevard and premiered Charles Ray’s sculpture Hinoki, followed by large scale exhibitions Lari Pittman’s Orangerie, Liz Larner, Gillian Wearing’s Family History, Raymond Pettibon’s Part I Seminal Early Work: 1978-88, Elliott Hundley, Rachel Harrison, Dan Graham, Walead Beshty’s PROCESSCOLORFIELD, Andrea Zittel, and James Welling. In September 2012, the gallery relocated to a new 20,000 square foot space designed by Michael Maltzan at 6750 Santa Monica Boulevard. This new location has allowed the gallery to continue its development as a premier venue for contemporary art in Los Angeles. Recent exhibitions include a 10 year survey of Sergej Jensen’s work, Lari Pittman’s monumental From A Late Western Impaerium, a new body of ceramic work by Liz Larner, Lizzie Fitch/Ryan Trecartin movies and immersive sculptural theaters, Anish Kapoor, Glenn Ligon’s Well, it's bye-bye/If you call that gone, Rachel Harrison’s Three Young Framers, Matthew Barney, John Bock’s Three Sisters, Toba Khedoori, Abraham Cruzvillegas' Autoconcanción, Wolfgang Tillmans, and Theaster Gates' But To Be A Poor Race.